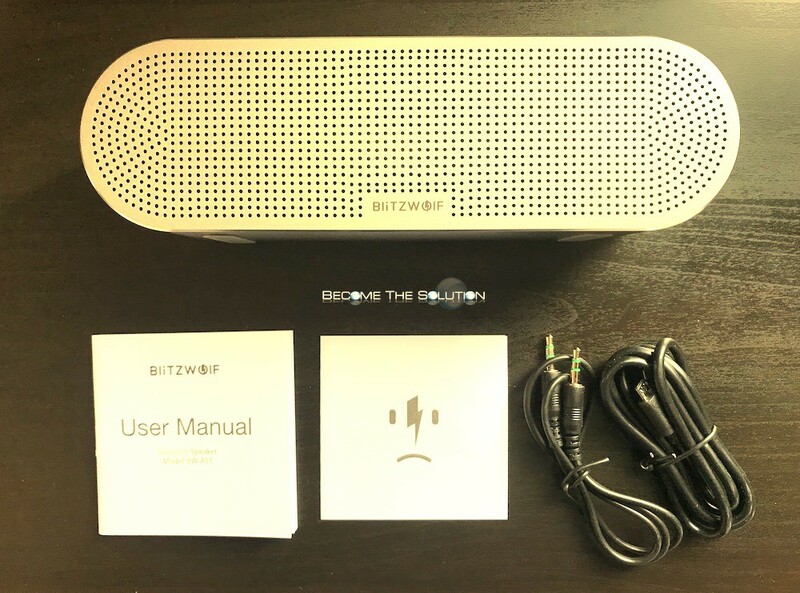 We were extremely fortunate for the opportunity to review BlitzWolf’s latest wireless Bluetooth 4.0 speaker (with A2DP/HFP/AVRCP profiles). The speaker was packed neatly inside a white sleek and sturdy cardboard cutout box. Underneath the packaged speaker were 2 small cardboard envelopes containing a micro USB charging cable and 3.5 audio cable. A user manual pamphlet and warranty card were also inside the box. There is no AC adapter included with this speaker. The BW-AS1 speaker is sealed inside a sleek aluminum case - making it look and feel like a speaker from the future! 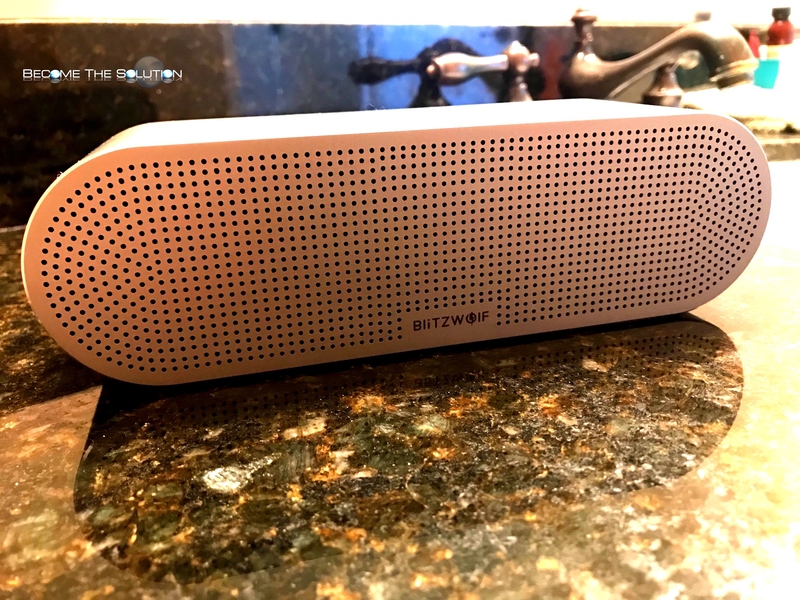 The attractive durable aluminum casing puts the BW-AS1 Bluetooth speaker ahead of other wireless speakers, given the affordable cost of the unit itself. The speaker is larger than most portable Bluetooth speakers we have reviewed on our site in the past, but not too large for portability comfort. The speaker weight (2.5 lbs) feels ‘just right’ for general movement around the house. Hold down the power button for 4 seconds to activate pairing mode. A blue light will begin to flash on the front-top of the speaker. Search for a Bluetooth device named “BW-AS1” on the device you are pairing with. Once successfully paired, the BW-AS1 will sound 3 deep bass tones over a few seconds. In our tests, the BW-AS1 speaker bass is crisp compared to other Bluetooth speakers we reviewed. The bass was substantial enough for good high and low pitches, but can quickly become less amplified as you distance yourself from the speaker. We found when we placed the speaker behind an object or wall, the volume and bass were more contained and sounded more powerful. If we turn the volume all the way up on the BW-AS1, we notice the 3 deep bass tone sound again, reminding us the speaker is already at max volume. This tone actually sounds for several seconds, so be mindful, it will drown out your music playing if you forgot you already maxed the volume. The speaker holds about a 3-hour battery charge (from a fully charged battery) while we played bass-heavy driven music with the speaker volume maxed and our paired device at close to max volume. The speaker will auto-power off after 5 minutes of no pairing activity. The speaker offers hands-free functionality. Use the play button to answer and hang up cellular calls. You can use the BW-AS1 in AUX mode with the supplied 3.5mm audio cable. In AUX mode, speaker will illuminate a red light at the top-front. Overall, we are very pleased with the BW-AS1 Bluetooth speaker. The value it brings in design and sound quality earned it a place in our living room area of our household. The speaker does produce 360° sound, but we preferred keeping the speakers back against something to output more volume. Currently, the speaker is running a limited promotional sale priced at $69.99. You can buy it now using this link at Banggood. Order the product on Bangood here. Blitzwolf i love your each every product and bwas1 that is pretty awesome and I'm eager to know his sound quality like before bwf3. Bwas1 is waterproof or not? Blitzwolf i love your each every product and bwas1 that is pretty awesome and I'm eager to know his sound quality like before bwf3. Bwas1 is waterproof or not?